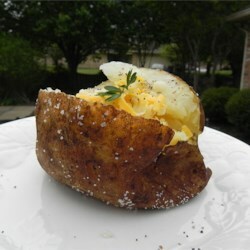 Place the potato in the preheated oven, and bake for 90 minutes, or until slightly soft and golden brown. Slice the potato down the center, and serve with butter and black pepper. Sprinkle shredded Cheddar cheese over the top, if desired.